Summary: It starts with an itch you just can't shake. Then comes a fever and a tickle in your throat. A few days later, you'll be blabbing your secrets and chatting with strangers like they’re old friends. Three more, and the paranoid hallucinations kick in. My Thoughts: This novel was one crazy depressing story. I know it's supposed to be but it didn't make it any less harder. We are introduced to Kaelyn who lives with her mother, father, and brother. Her father is a doctor and a well respected one. Kaelyn is just a shy teenager. She doesn't really fit in at school, nobody picks on her, but she's just average. She's invisible to the popular kids and just kind of stays to herself. She does have a few best friends though. An epidemic, or sickness, starts to break out within their small town on an island and people start to fall ill. Everyone starts to wear face masks, and if you see someone sneeze or cough you better start running. If they start scratching themselves, you get away fast. While, her father looks for the clues, Kaelyn is trying to find her own answers. Very few are surviving the sickness and as people start to die and the rest start to act crazy, Kaelyn is scared. She's scared they will run out of supplies, she's afraid of people dying. This novel was basically written in letter entries-diary entries to her best friend who she is trying to make up with. They had a fight and she hasn't talked to him since. She wants to rekindle their friendship. 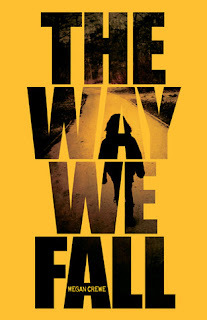 The Way I Fall was an interesting novel to read. It wasn't my favorite book of the year but it was a good story. I debated between giving this book a 3.5 rating or a 4. But I finally decided on a 4 because I did enjoy reading it a bit more than I would a 3. Overall: All in all, I really enjoyed it. I liked all the characters and I'm glad there was a bit of romance thrown into the story. I'm also excited for the next book because of course the ending leaves you hanging! I think I may end up liking the next book more as other characters will be mixed in (I think). Cover: Like it but it's kind of plain. I've seen a few different covers for this one but I do like the yellow the most. While you didn't unequivocally love this one, I'm still really eager to read it. The concept is just really fascinating! I actually don't like the yellow of this cover other than the fact that it is different. I was also split on this book-there were some good stuff but also some meh stuff.